There's the new white trim colour (Benjamin Moore Chantilly Lace OC-65) over the body colour which is staying the same (Benjamin Moore Sidewalk Gray 2133-60). 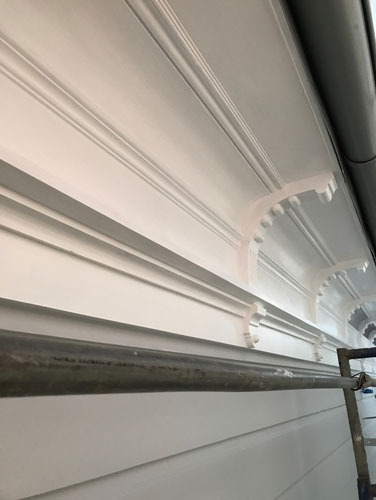 We aren't changing the house colour too dramatically, but we are adding some definition to the trim details Woody has spent so much time restoring. 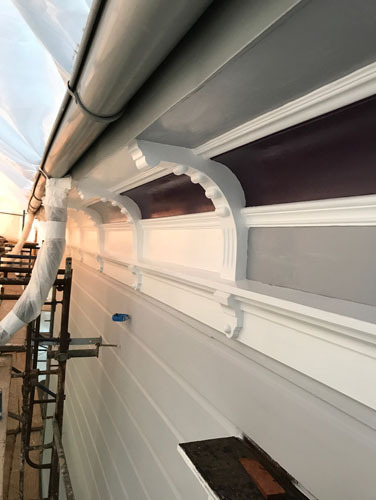 We got a pot of Benjamin Moore Purple Rain 1386 and are doing some tests on various colour schemes for the crown at add even more definition. I did some Photoshop mockups and liked a crown with medium gray at the underside of the eave and on the fascia, and a purple on the cove. The purple I chose to begin with was not rated for exterior use, so Woody chose this purple as a close approximation. We had a discussion today about possibly changing the purple, but modulo a few details there I like the gray/purple combination better than the white/purple or white/gray. I have been following this monumental renovation with great interest. 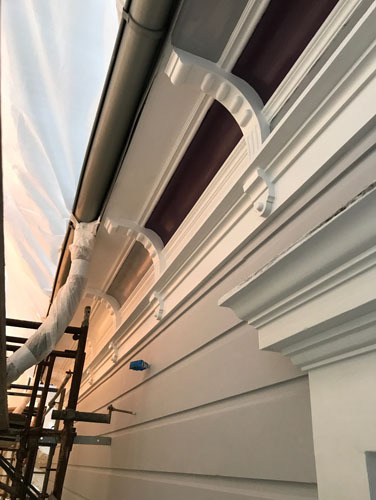 I haven't commented in a long time but today, I just had to say something… The trim and body of the house are looking stunning!!!! I cannot imagine what all of this detailed and careful work is costing, but kudos to you and Noel for renovating your home in this fashion. I cannot wait to see the end product. And then, I look forward to your continuing posts on your gardens, which I suspect have taken a beating with all this construction underway. Peggy, the garden is indeed in very sad shape. But the good news is that then I can redo some parts of the design that were not working, right?